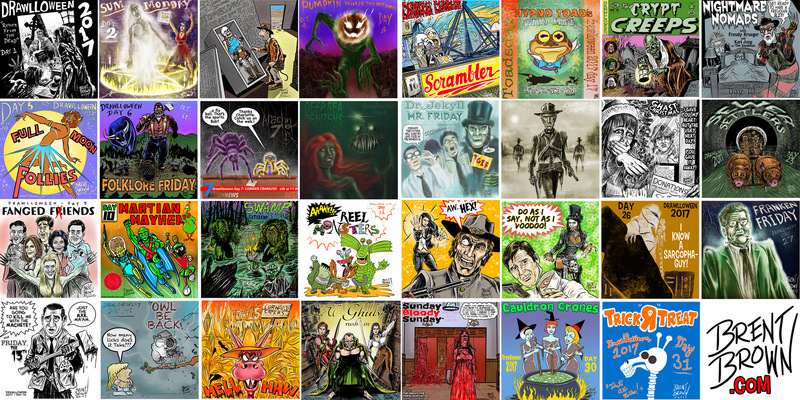 So another Drawlloween has come to an end. Each year I start and after the first couple of drawings get overwhelmed by the many more that are ahead and wonder if I will actually be able to do it, or just give up, since no one is really watching or counting. Maybe I will skip a day if I can’t come up with something or just don’t feel like it. But I actually did it again, and it didn’t even feel like a daily chore I had to get through, I actually looked forward to it. So much so, that I would up getting the next day’s drawing done a day ahead of time because I was so into it and couldn’t put it down until the wee hours of the morning. That’s why I ended up posting them on Instagram right at midnight, since most of the time, there were already done by then! Today’s prompt was generic in order to give everyone a wild card to do whatever they wanted, but since I’ve been pretty literal about all of the days so far, I went ahead and tried to interpret this one as being like the “Toys R Us” toy chain logo with their giraffe mascot, Geoffrey. I ended up making it a giraffe skeleton and the logo jack-o-lantern orange with a skull instead of a star in the capital R. Pretty simple and not as involved as the others, but hey, I was tired and giving me too much freedom results in me being lazy, which is the entire point of this thing for me. In any normal month, I would not be drawing anything for the fun of it, and this daily challenge is just what I need to get me to muster the same amount of diligence to create work for my own portfolio that I would give to a paying client I know is expecting something at a certain time. Now I have 31 little pieces of art I normally would never have had. Sure… much like these blog posts, practically no one saw them, or gave a flying phantom about them if they did, but the visceral social media reward of “likes” was only secondary in creating the impetus to get these done every day. So, even though I am aware I am talking only to myself here, I want to thank those who took the ride with me and those who created the ride to begin with. That’s it for another year. I may do the Caricature Resolution challenge in January too again, so there’s always to to look forward to, or away from, depending on who you are. Happy Halloween! Good news to all those out there who don’t like Halloween or art or Halloween art or just my particular Halloween art in general…. 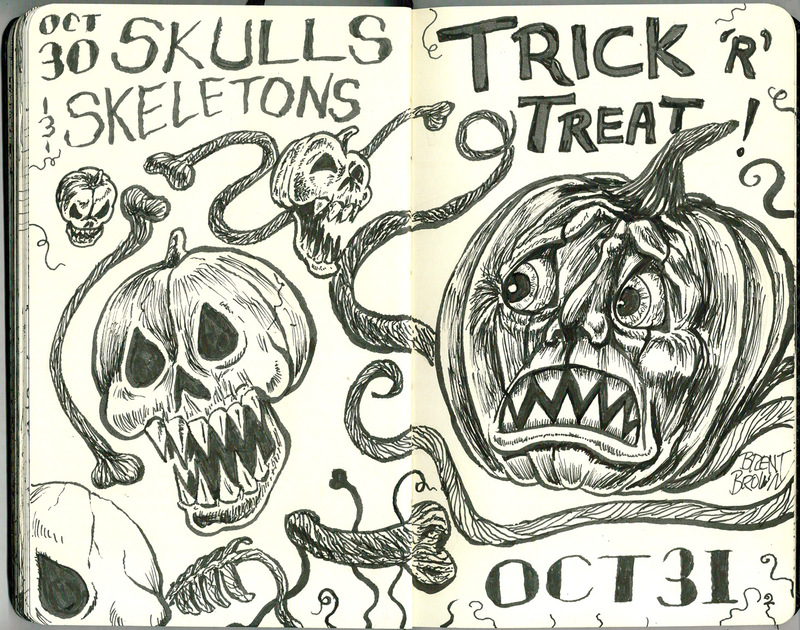 You don’t have to ignore these any more because today is the last day of Drawlloween 2016 in Inktober!! 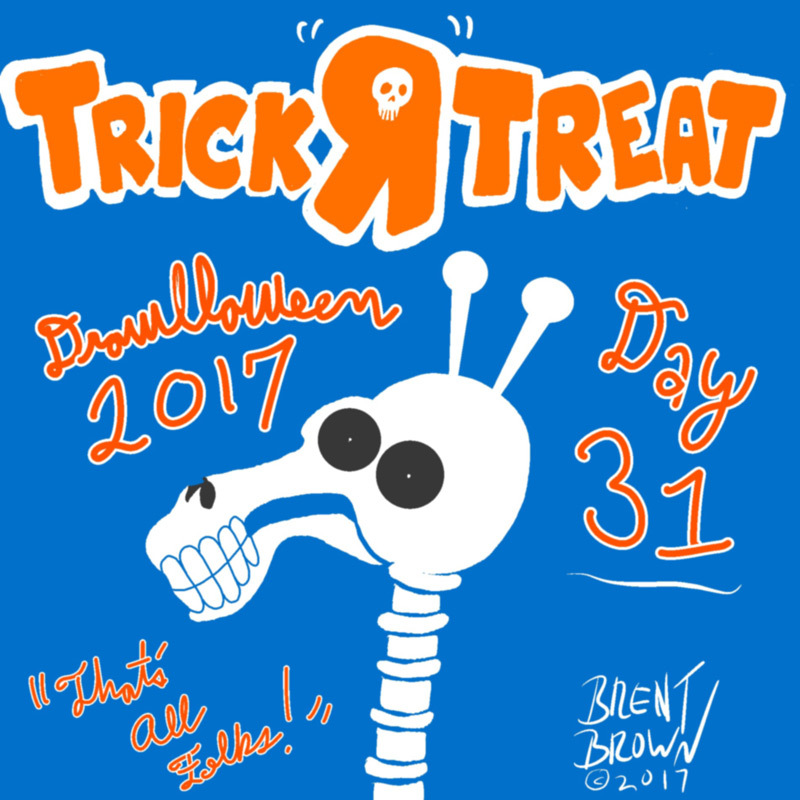 Day 31 is: TRICK ‘R’ TREAT! I really couldn’t come up with a good angle for these two, so I just drew whatever and inked it in. It’s a jack-o-lantern with some of what I imaged skulls and skeletons of pumpkins might look like if gourds had endoskeletal structures. If I decide to do it next year I will be back, if not, you’re welcome. These two prompts seemed made for each other (to me, at least) as both are antagonists from 80s cartoons. SKELETOR from “Masters of the Universe” was thwarted by He-Man almost as often as MUMM-RA was by his nemeses, the “Thundercats”. Both seemed awfully ripped though, for never actually being seen in the gym. 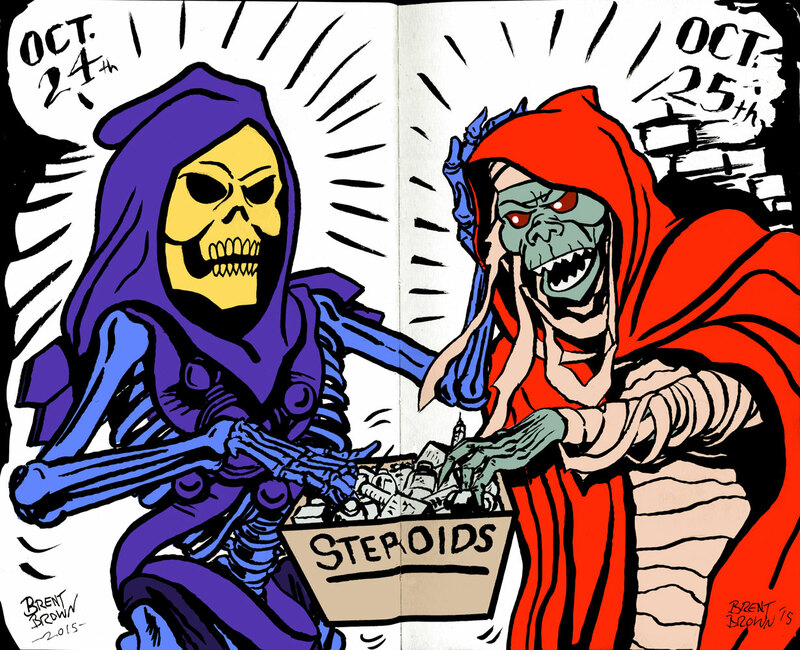 I decided to show Mumm-ra’s pre-bulked up phase and Skeletor’s more-appropriate-for-his-head body and them fighting over the steroids that they must be taking to get such gains with no lifting or protein powder. Inked in the sketchbook and scanned in to be digitally colored in Photoshop.